You are here: Home / Ed Tech / SIS to Facebook Direct. Introducing Schools on Facebook. SIS to Facebook Direct. Introducing Schools on Facebook. Hi! I'm Michael Staton and I'm a guest blogger. What I say in no way represents Michael Feldstein or his ancestors. Also, our screenshot here is of our app with Abilene Christian University, a school known for being a thought leader in instructional technology and mobile learning products. (They give their students iPhones. No, really. They do.) I am also not representing ACU, its trustees, nor their ancestors. So, as I said yesterday, Oracle's had a short few partners for this upgrade. With the others included being mainstream LMS systems, you might wonder why Oracle would bother with an upstart like Inigral who hasn't even invested in a good marketing site. I hope to answer that question here. If you read Michael's blog often, this post will be of interest to you. We are introducing a product we're calling "Schools on Facebook" (in private beta) that is a private, secure application (on Facebook) that can be skinned with a schools branding and connect with their current technology infrastructure. It doesn't compete with but complements CMS and LMS systems by focusing on socialization and relationship building; more on how below. It's a cliche when a start up claims to revolutionize this or that. So, at Inigral we try to stay realistic: we're focusing on adding a social layer to what already exists. We want to change the conversation about the internet in education from one of using the web to "manage courses" to one about using the web to facilitate the relationships that develop on campuses already. After all, a real learning environment is one built on the mortar of person-to-person exchange. Why not have an application that focuses on that? No software is a better example of this than Facebook, which took your campus by storm less than four years ago. Students started engaging in high-frequency, (some might say mindless) contact that seemed to help students connect with their peers to build and maintain relationships throughout their campus experience. And you never even paid for it. Some of you[r colleagues] (not you, you're too savvy for that) even talked about shutting it out. But as time went on more of you (and you were early on this one) started to realize what Nicole Ellison documented in her research: that Facebook magnifies the "connectedness" that people feel to your school, one relationship at a time. Students use Facebook to represent their identity, and they fill out all sorts of information to that end. 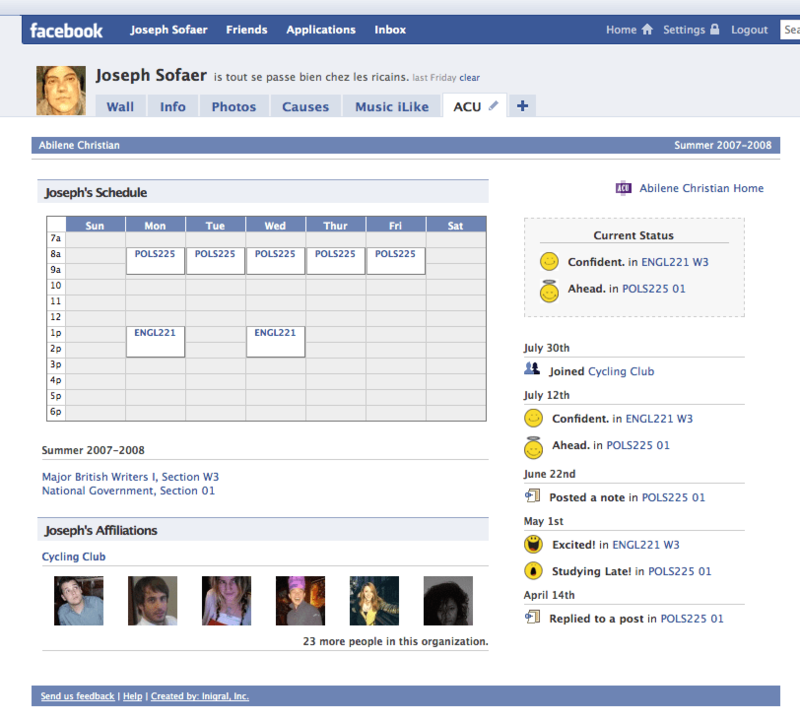 Our product, Schools on Facebook, delivers course schedules, majors, organization memberships and other on campus affiliations to Facebook. It also shows that "campus safe" identity to classmates and instructors, which helps to build conversations by introducing "primer" information, i.e. "I see you're a member of the economics club, are you planning on being an economist?" Students use facebook to talk about school all the time, our application just enables a students' course information to be a part of those conversations. It also enables contact between faculty and classmates who are not "friends" with a student on Facebook. Faculty that have ventured on to Facebook have struggled with whether or not to be "friends," and the safest bet with the least amount of line crossed is to not be friends. Through our application, campus exchanges can stay out of the personal part of Facebook, and the personal part of facebook can stay out of campus exchanges. It has some other great features, too. But I don't want to take up any more of Feldstein's blog with our pitch. This is the first public announcement that we are currently selecting two more schools to participate in our limited beta this fall. We're only taking three, and we've signed up one and have a big name other in the pipeline (huge name, actually). We're looking for the "right" school, one that's going to be excited to see what the Oracle upgrade can enable, one that isn't afraid to say "we think Facebook adds value to our campus," and one that's not afraid to talk about using cool technology openly to others in higher ed. Contact me at mpstaton a t inigral.com if you're interested. As you know, the beginning of the school year is a hectic time for all of us!! I will try to get to all emails as quickly as I can. There are some (to me at least) issues with integrating a SIS into Facebook, all the time facebook has a less than stellar past with regards to privacy and snooping on their “customers”. Forcing students to use it for studies seems unlucky, at best. For those students that are willing (and has already) given up their privacy to Facebook, nice idea. The social network part of Facebook (and similar applications) does offer an angle that is lacking in regular LMS implementations. I should add that we have thought about FERPA pretty heavily (and paid our high-profile law firm a hefty sum to help us), and there is nothing in our application that violates the law or someone’s right to privacy. We have specific measures to put both risk averse decision makers and law-suit happy parents at ease. The data never goes to nor touches Facebook. Campuses can choose to have the app running in a cloud somewhere that we set up, or they can also choose to run it from a local server on their campus. Facebook can never get hold of the data. In addition, students don’t “have” to create a Facebook account. Just to clear any misunderstandings with the way applications work on Facebook, applications do not live within Facebook. Facebook merely presents a window for the application and communicates back and forth necessary information to make the relationship work (facebook id number, thumbnail pic, notification and feed item templates, etc.) Facebook couldn’t even get an applications data if it tried. Well that definitely much better than I presumed. As long as there are options (i.e. using the app outside Facebook) I don’t really object. However I do see some issues with what in effect is outfitting facebook with a seal of approval from various institutions when thinking about the various privacy issues that is associated with facebook (beacon, beacon^2, etc.). This is a very interesting idea and is consistent with some of the things I’ve been thinking about lately regarding “open learning nteworks.” But I can’t help but wonder about the whole creepy treehouse problem. I know this is anecdotal, but I’ve had several conversations the past few weeks with students on my campus (BYU) about how weird it is to get friended by their professor on Facebook. Maybe new applications like this will force the culture of Facebook to change. However, I worrry that many will not find it a welcome change since they largerly think of Facebook as their *social* destination online, and not a *learning* destination. We have found through our experience with Courses that students are largely uninterested in using Facebook as a learning platform, but they are very interested in using Facebook to connect with people in their academic environment in new and different ways. They use it to predict who they should meet, to follow up with people they have met, to create a perception of keep in touch with light-hearted interactions, to express themselves in a low-stakes manner, and to accelerate their personal relationships by relating more comprehensive self-concepts. Schools focuses on these concepts. As we said, we’re adding a social layer to what already exists in a campus environment, not competing with it. And, we’re tying campus relevant (and safe) information to Facebook. Thanks for the clarification. Your approach makes a lot of sense. The ideas of layers, openness, interoperability are all great steps in the right direction. The more automony we give to students to control their own spaces how they want to control them, the better. Great that you have ACU on board. They really are innovators in this space. I wish you the best with your other candidate schools. A start-up company called Inigral has recently launched a beta product that connects Oracle’s Campus Solutions Student Information System to Facebook. The product, called Schools on Facebook, brings student data (allegedly through secure methods) to ….